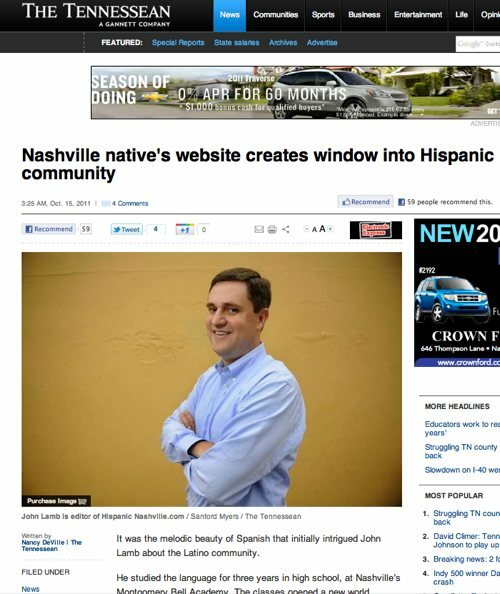 This past Saturday, the final day of Hispanic Heritage Month 2011, and less then a week before this site's 8th anniversary, The Tennessean wrote a feature about me and HispanicNashville.com. It ran on page 1 of the Local/Business section. Thanks to Nancy DeVille for researching and writing the article and to her editors for the story idea. The print edition, for those of you who didn't see it, carried the headline, "He'll keep you up with the Lopezes." The copywriters came up with that one; they have the hard job of hitting all the right notes in a headline. It's a spin on the familiar phrase "keeping up with the Joneses" - doubly so - in that it changes the original in two ways ("keeping up with" is presumably meant as just "knowing what's going on with," and then "Jones" becomes "Lopez"). Some of you read the story over the weekend and sent some nice words my way – thank you.